This modern photo was taken by guest photographer and Tampa Historian extraordinaire, Dan Perez. Be sure to visit Dan’s two websites, Tampa Natives Facebook page and Tampa Pix. 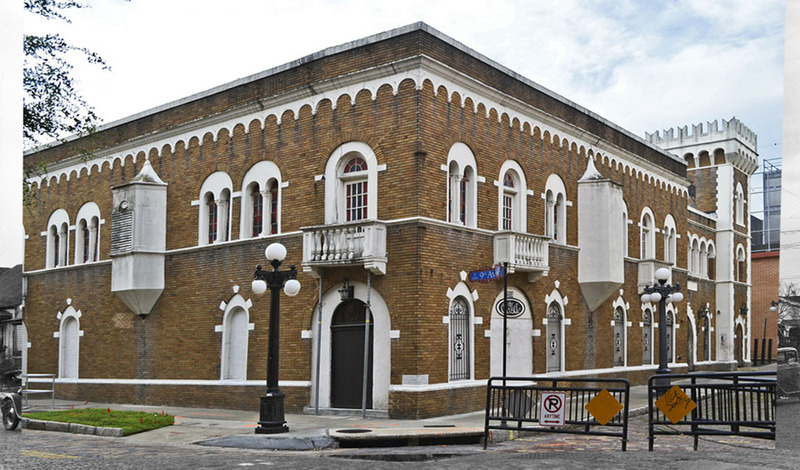 Cooperative El Primero Progresso, also know as the “Labor Temple”, was the meeting place for Tampa’s labor force in the early 1900s. 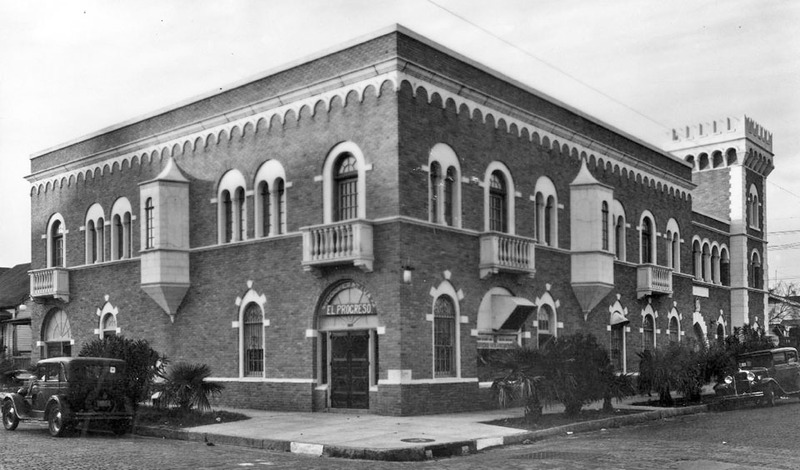 In addition to its Latin clubs, Ybor City had numerous labor and other fraternal organizations as well. The most important preserved building associated with labor and unionism in general is the Labor Temple at the corner of 9th Avenue and 16th Street. Ybor City’s cigar worker and restaurant unions jointly occupied this building. With cast-iron grillwork, round arched stone window and door surrounds, white stone balconies, oriel windows, and square-shaped tower capped with a crenellated parapet, this edifice bears a striking resemblance to a Spanish castle. As economic dislocations resulting from the strike became more acute, native Tampans reacted angrily. Most local leaders believed that the majority of workers were anxious to return to work, but were prevented from doing so by labor radicals. In reaction to the alleged influence of socialist and anarchist “agitators,” business and professional elites formed another citizens’ committee. Membership in this organization swelled as confrontations became commonplace and the sound of gunshots rang through the city. On September 14, Tampa’s attention was galvanized by the news that James F. Easterling, an American bookkeeper employed at Bustillo and Diaz Company, had been seriously wounded. The shot which struck Easterling came from a crowd of Italian and Cuban strikers gathered at the factory. Branded by socialists as the “Cossacks of Tampa” these patrols remained active even after three of the arrested strike leaders were convicted and received sentences of a year on the chain gang. The patrols were particularly vigilant in their efforts to disperse union meetings. On one occasion they entered the Labor Temple in Ybor City, broke up a meeting in progress, smashed furniture, confiscated records, and nailed the door shut with a sign overhead reading, “This place is closed for all time.” When the union newspaper El Internacional continued to print articles critical of the citizens’ committee, a delegation raided its office, destroyed its presses and intimidated employees found on the premises. On December 22, Tampa’s police further attempted to silence the labor press by arresting El Internacional’s editor, J. M. Gil, on two counts of conspiracy to prevent cigar workers from working. More information about the Labor Temple can be found on the Tampa Natives Facebook page. Thanks Bryan! When I took this photo, I had never seen the older photo. It was purely by coincidence that I stood at the same vantage point. It was only after coming home and researching online as to what this building’s original purpose was, that I found this old photo. You’re not supposed to tell everyone you took this re-photograph by accident… I’ll sometimes spend 20 minutes at one location trying to line up the photograph, only to find out later that I need to go back and try again. Great work nonetheless! a friend of mine has a book that was published in the 1950’s describing the place as the waiters and cigar makers union hall. i’d like to know where there are more historic pix of the wonderful building now known and owned by ‘the castle’ a goth culture club. lisa, i’m a long time patron of the current castle. i’m just snooping around for more pictures of it during all those years from 1930 until 1990.
any pictures of the original union temple on 8th ave would be awesome as well. in our anti-union times, it is very important to keep the truth alive so our children don’t make the same costly and fatal mistakes.